This article focuses on LED rope light uses in relation to vessels and docks. On boats and vessels, LED strip lights are utilized for general illumination, safety or guidance and aesthetics. Common places to install the cutting-edge units include stairs, decks and outdoor pathways. In such areas of the vessel, the lights could be placed under rails or in between spaces for accent or indirect illumination. This also prevents direct contact with the luminaries. To save space inside cabins and storage rooms, LED strip lights may also be installed on cabinets. Colored LED strip light variants, such as red, blue, green and violet, can be setup on the exterior for accent lighting around the boat. RGB effects are ideal to use at night or during small gatherings. A full light display could also be applied while the vessel is at the dock. In addition to boats, docks in marine locations can benefit from LED rope lights. Because the devices are waterproof, solid state and rugged, the units are capable of withstanding outdoor elements associated with the area, including saltwater corrosion. 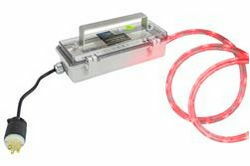 Along docks, LED rope lights could be setup on rails, walkways, steps, entry/exit points and poles. Furthermore, the luminaries can support markers for gates and signs. Solar-powered models, with batteries, are recommended for docks located in remote areas. To save power and for efficient operation, day/night photocells or motion sensors may automate functionality.